Going skiing this weekend? 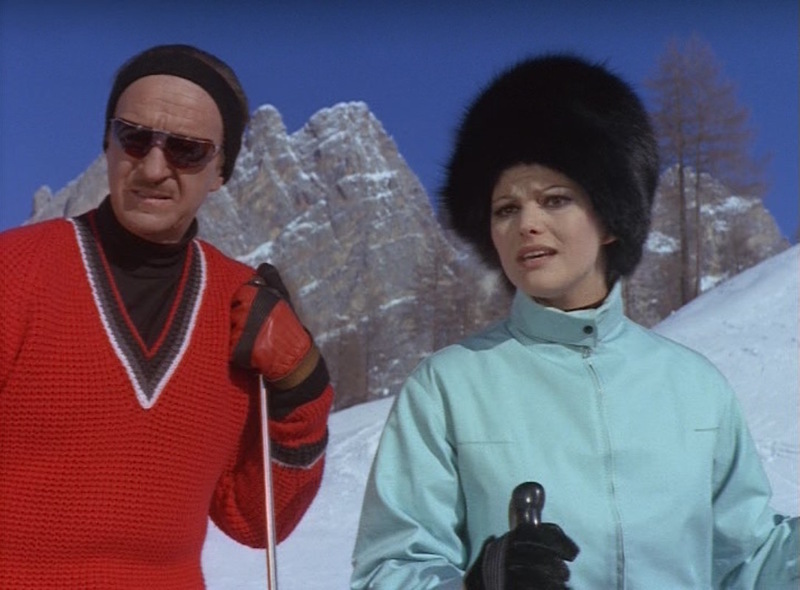 A surprisingly stylish look at elegant mid-century ski culture comes from The Pink Panther, the 1963 comedy crime caper starring David Niven that would spur a series of sequels focused on the bumbling Inspector Clouseau (Peter Sellers). Clouseau was initially meant to be a secondary character, a foil to Niven’s suave, sophisticated jewel thief, “The Phantom”. 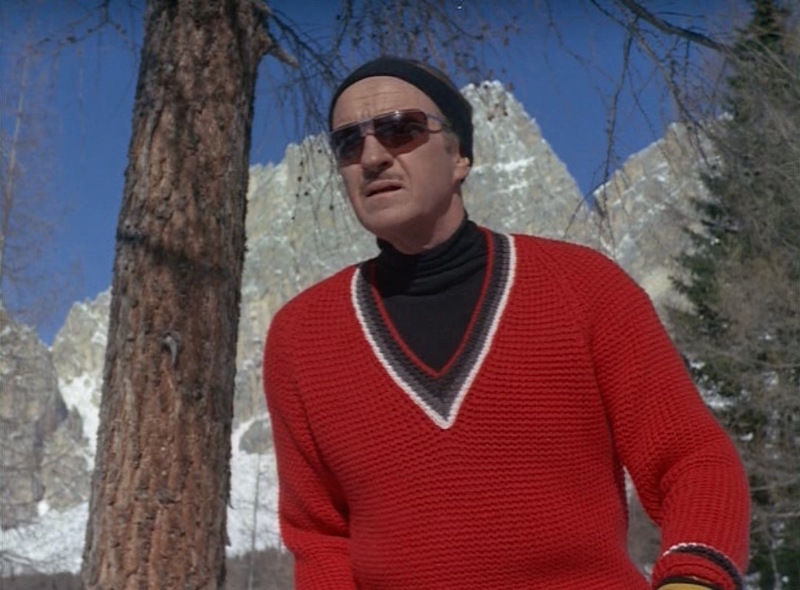 However, Peter Sellers’ performance was a breakout hit, and a second film—A Shot in the Dark (1964)—was immediately put into production with a primary focus on Clouseau to the total abandonment of the other characters and plot points, leaving The Phantom and Clouseau’s ex-wife Simone (Capucine) free to spend a life of larceny together. 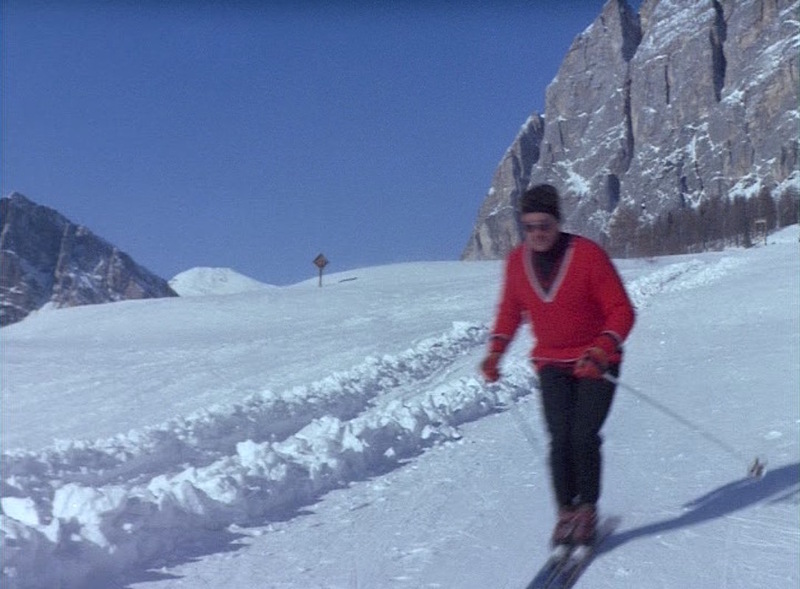 As part of his plan to steal “The Pink Panther”, rumored to be the most valuable diamond in the world, Sir Charles Lytton travels to Cortina d’Ampezzo, the fashionable ski resort town in the Italian Alps that also served as the setting for movies like Ash Wednesday (1973) with Elizabeth Taylor and For Your Eyes Only (1981) starring Roger Moore as James Bond. 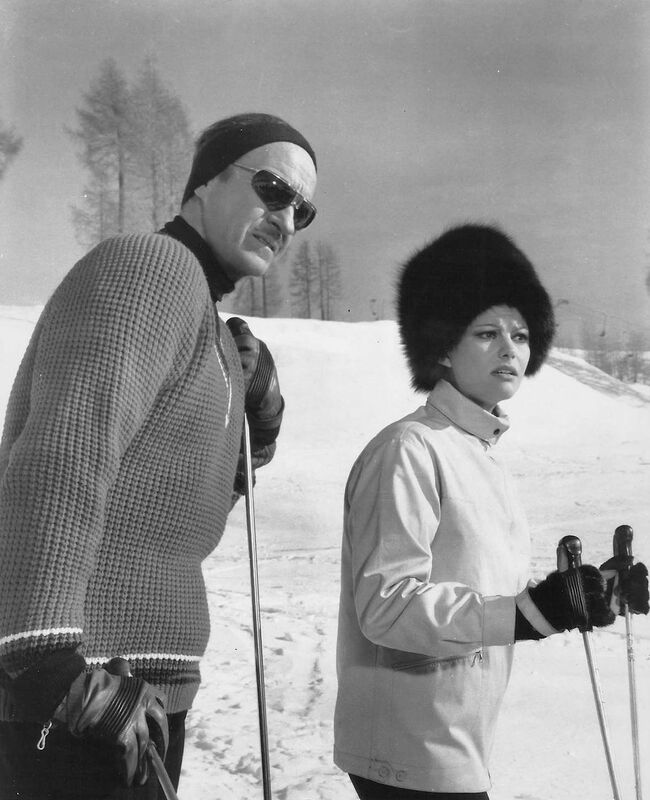 It’s on the slopes at Cortina that Sir Charles carries out the first phase of his plan to steal the diamond from its owner, the glamorous Princess Dala (Claudia Cardinale), by making her acquaintance then dramatically skiing in pursuit of the man who kidnapped her dog. For this, Sir Charles dresses in his usual ski attire of a colorful v-neck sweater layered over a fitted black lightweight turtleneck jumper. The raglan-sleeve sweater is a bright scarlet red ribbed knit wool with red, black, gray, and white striped piping on the deep V-neck line, both cuffs, and around the waist hem. The Phantom, looking cool and determined for an action-packed day of skiing. Sir Charles wears plain black ski pants. Combined with his black turtleneck, it evokes the villainous look of his “cat burglar” persona that he merely covers with a brightly colored series of sweaters; if he would remove the sweater, he looks just like he does scaling rooftops and breaking into safes as The Phantom. Seen only briefly as he takes off down the hill after Princess Dala’s dog, Sir Charles wears his ski pants tucked into a pair of black ski boots with red laces. The heavy sweater, worn in lieu of a bulky coat, keeps Sir Charles warm while giving him greater mobility. 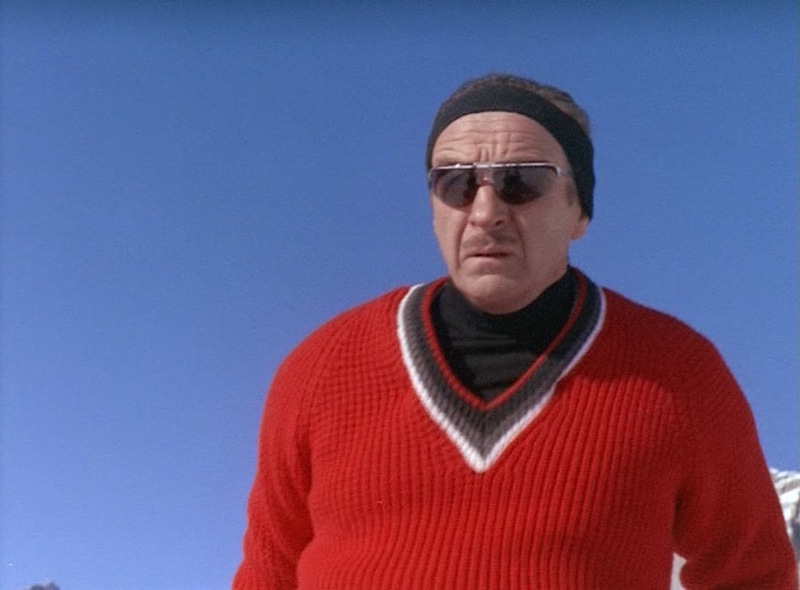 Thus, the only additional items he needs to protect himself from the cold are his plain black headband and his red leather ski gloves with black trim. “Leave this to me, ma’am,” Sir Charles assures Princess Dala before skiing down the hill after a dognapper. Sir Charles’ futuristic wraparound sunglasses appear to be the fashionable Renauld “Spectacular” model that evolved from the Space Age-inspired Sol Amor sunglasses pioneered over the previous decade. Famous Renauld wearers include ’60s style icons like Jacqueline Kennedy and Elvis Presley, whose own pair from Follow That Dream (1962) was auctioned in August 2017. The previous day, when surveilling his the princess (and her dog), Sir Charles wears a bright yellow widely ribbed V-neck sweater over his usual black turtleneck and ski pants. We also see that he seems to coordinate his gloves to his sweaters, here wearing a pair of mustard yellow-and-black leather ski gloves that echo the layers of his top half. Sir Charles sets his nefarious kidnapping plan in motion. 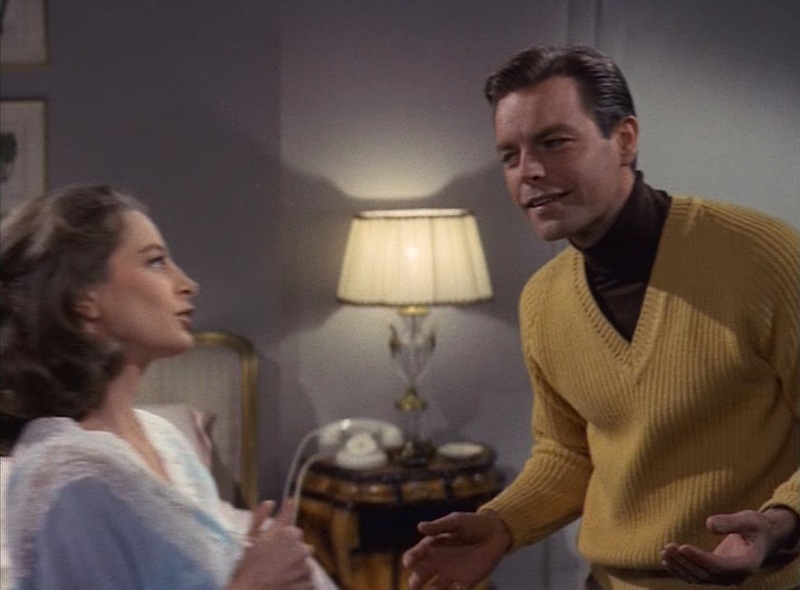 Evidently, this aesthetic would be echoed by his nephew George (Robert Wagner) when the young man attempts to seduce Simone Clouseau (Capucine) during a madcap night hopping between bed, bath, and beyond, though George’s sweater is more of a mustard yellow than the bright neon shade worn by his uncle. George Lytton not only borrows his uncle’s layered style, he also hopes to get his hands on his mistress. 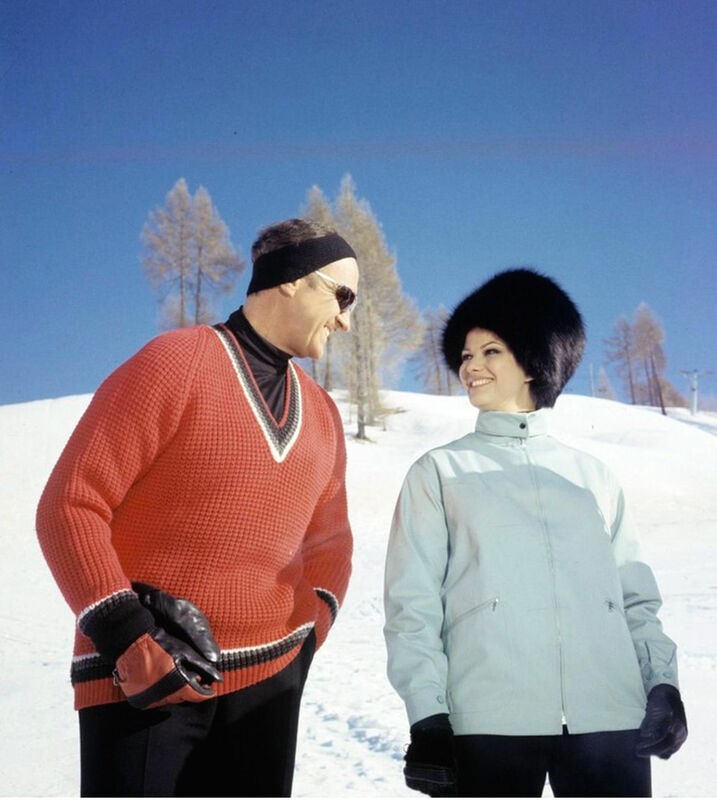 The Pink Panther was made in the waning years of luxury skiwear, when jet-setters spent their winter days on the slopes before decadent après-ski evenings. 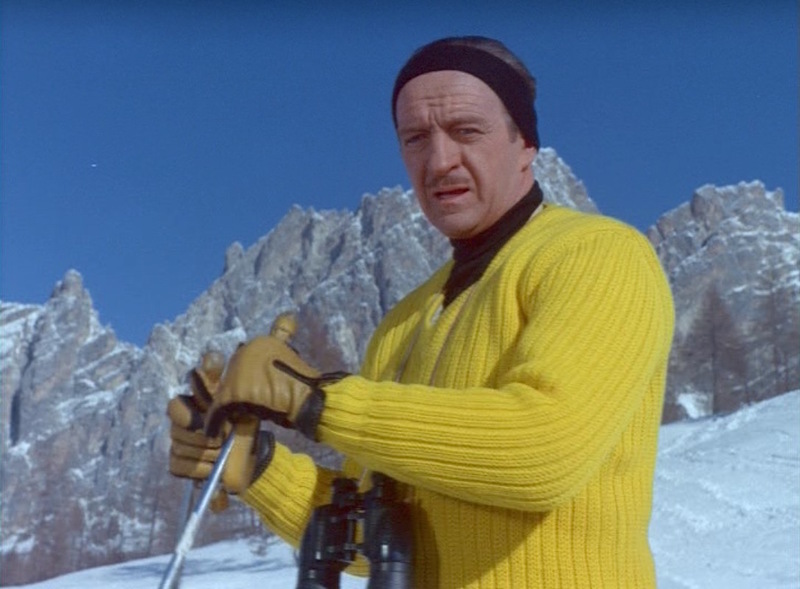 Thus, Sir Charles Lytton’s ski sweaters have a colorful elegance to them, a byproduct of both the era and David Niven’s own sense of refinement. Thanks for this! This is a favorite wintertime movie of mine. I actually slightly prefer this to A Shot in the Dark, though both are plenty charming. Love this, buddy! Great job.